The origin the Scotch eggs is disputed: they either came from North Africa and were flavored with cloves, originated in India in the early 19th century with curry and mutton, or a they came from a 19th century Yorkshire pub and were made with fish paste. However they began, I’m glad they are still with us today. I made a more traditional version with pork, sage, and onions. 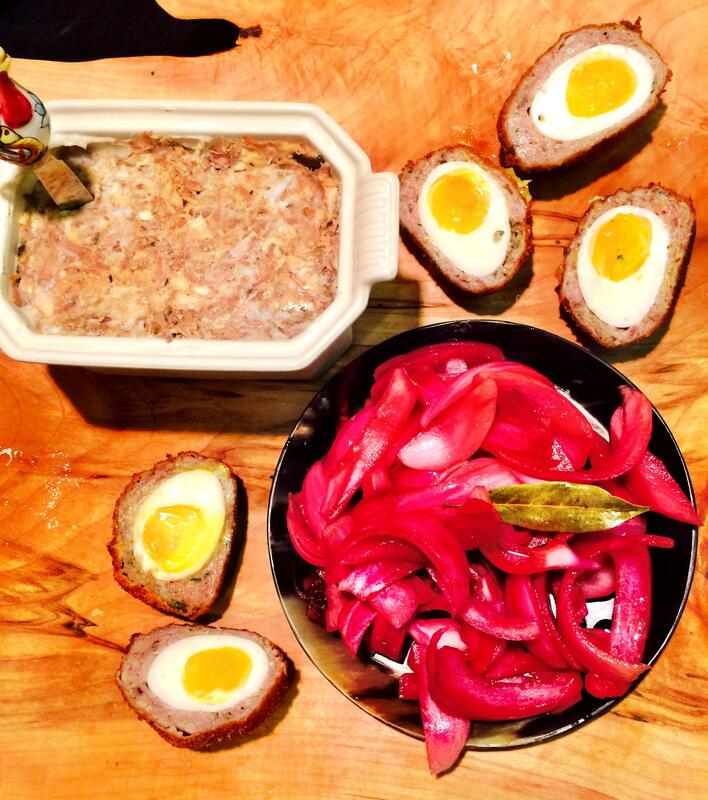 The trick to making the perfect Scotch egg is to get the pork fully cooked while keeping the yolk soft and runny. The basic steps are – peel a soft boiled egg, wrap in a sausage mixture, and deep fry. I found that boiling the eggs for six and a half minutes makes the eggs sturdy enough to peel without breaking, but keeps the yolk runny. I adapted a recipe from the cooking channel for the sausage mixture: http://www.cookingchanneltv.com/recipes/scotch-egg-with-curry-mayo.html. Mix the sausage with onions, herbs, spices, salt and pepper. Add the chicken stock and mix very well. Reserve in the fridge. Remove 8 eggs from the fridge, and bring water to boil in a medium-sized pot. Drop in 4 eggs, and boil for exactly 6 minutes and 30 seconds. Transfer the eggs to a bowl of ice water. Repeat with the last 4 eggs. Peel the eggs carefully. 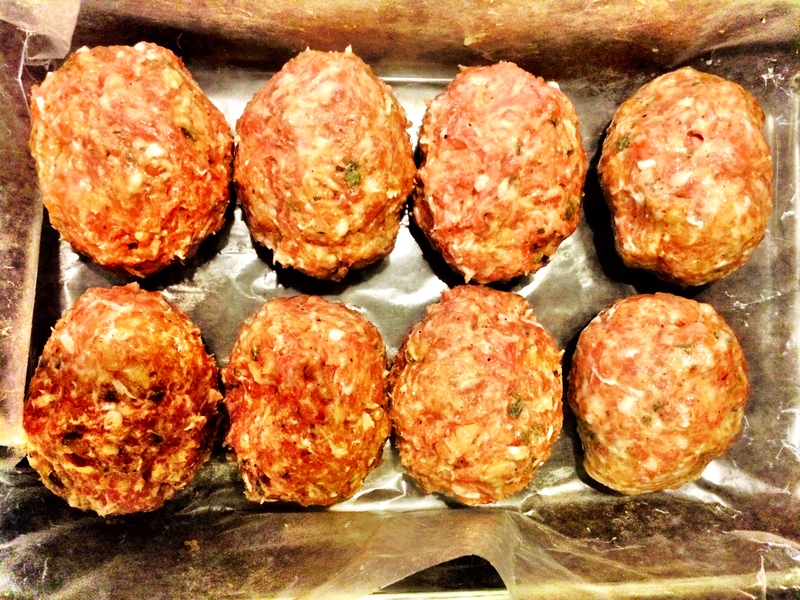 Take 1/4 cup scoop of the sausage mixture, flatten in your palm, and wrap the egg. This part takes a little practice and is a little easier with wet hands. Reserve these in the fridge until you are ready to use (I made these the night before, and they turned out fine). Heat 2 inches of oil in a large Dutch oven to 350 degrees. Set up 3 dishes and fill one with flour, one with the remaining two eggs (whisked),and the last with the breadcrumbs. Dredge the pork-wrapped eggs first in the flour, second in the eggs, and third in the breadcrumbs. When the oil is hot, drop 4 eggs into the oil and fry until they are a dark golden brown, or about 3 minutes. Flip half way through. Remove onto a paper towel-lined plate. Repeat with the next 4. Cut one in half. If the pork is not fully cooked, it’s okay. Stick them cut-side up in a 350 degree oven until the pork is done. Serve with pickled onions, and mustard. They are sturdier than they may look, and make great leftovers. 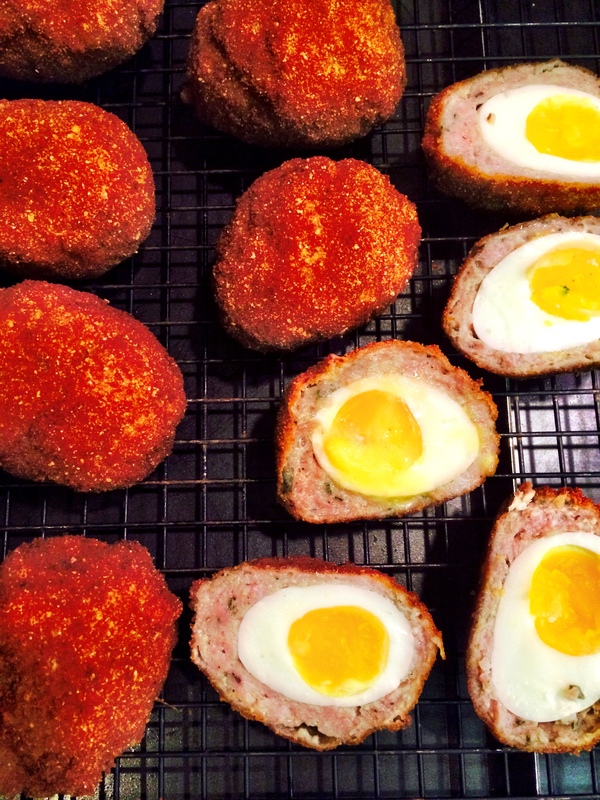 I’ve never had a scotch egg, but every time I see one made well it gives me the urge to make one. I’ll have to give this a try! Thanks! If you try them, let us know how they turn out! They are fun to make once you get the hang of it. I heard these were delicious! Sad I missed them when you made them–so I guess I’ll just have to make some of my own!